While much of the country is still in early spring, the desert is moving quickly through its yearly spring and toward what most would consider summer. 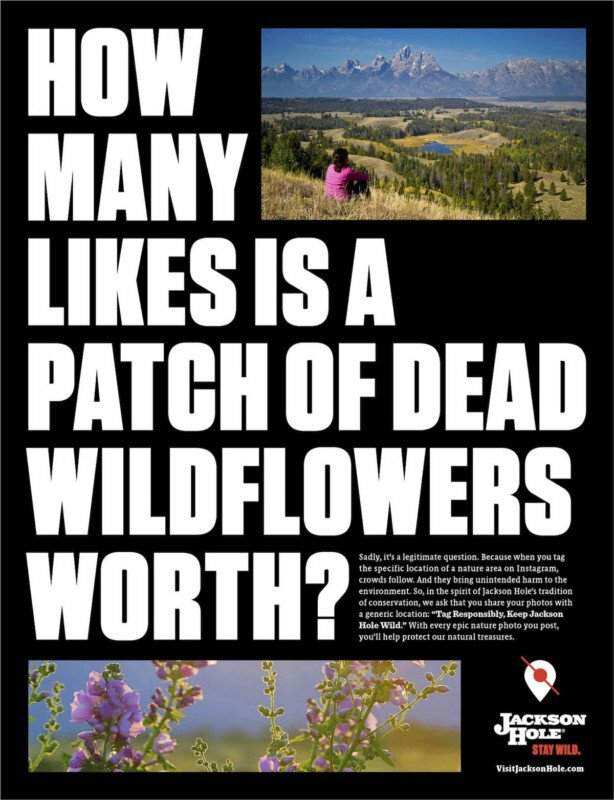 As of this writing, we are still in the sweet spot of a bumper crop of blooms. The native desert plants are taking their turns in showing off. Most of the year our cacti look like a pincushion holding onto its requisite supply of pins, but hidden in the DNA of each of these organisms is the promise of blooming beauty. 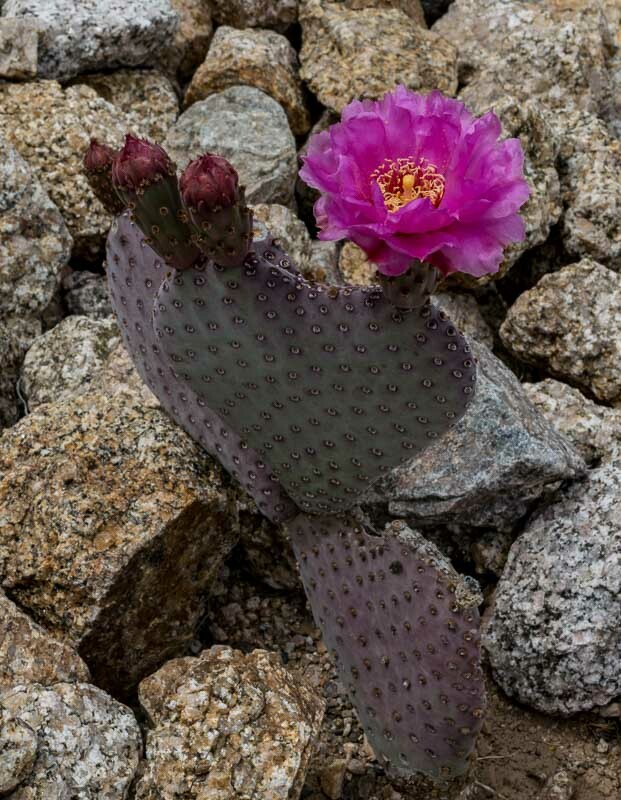 Some of the blooms like our pink Opuntia (see photos above and below) look as though they would be more at home floating in a tropical drink. 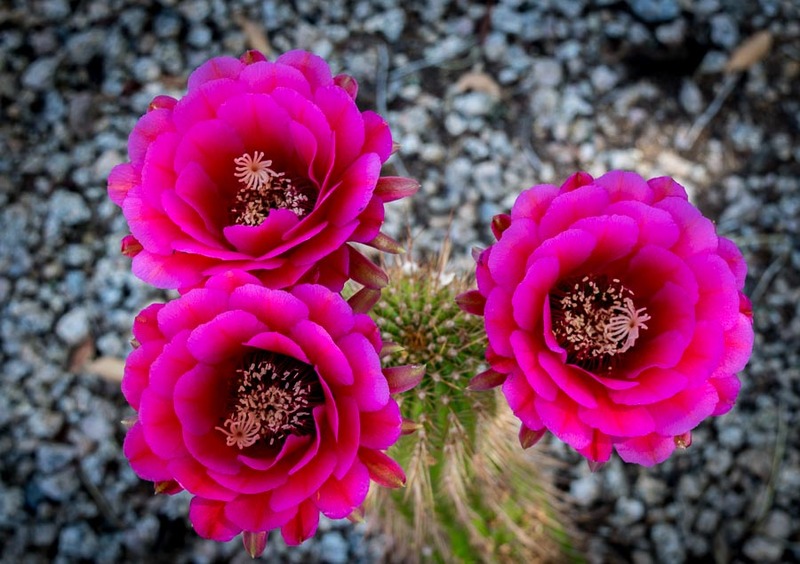 As pretty as these are, many of the cactus flowers have a prime bloom duration of only one day, but what a bloom it is! 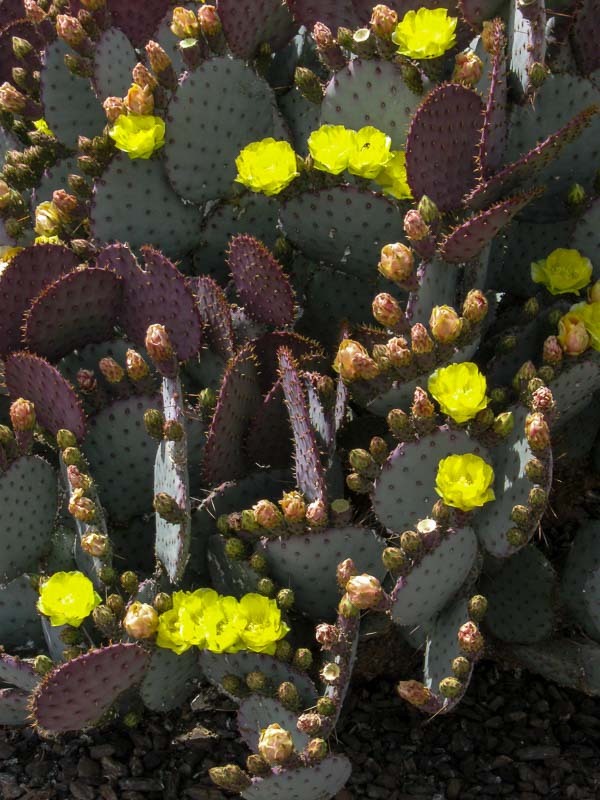 You may know Opuntia cacti. They are the “paddle” cactus family. They have large, flat paddle-like growths that look similar to the ears of a number of Walt Disney characters. The picture below better shows the paddles with the pink bloom atop. To the left of the bloom are “ladies in waiting,” so to speak. The buds will plump until nature tells them it is their turn to open and show off. 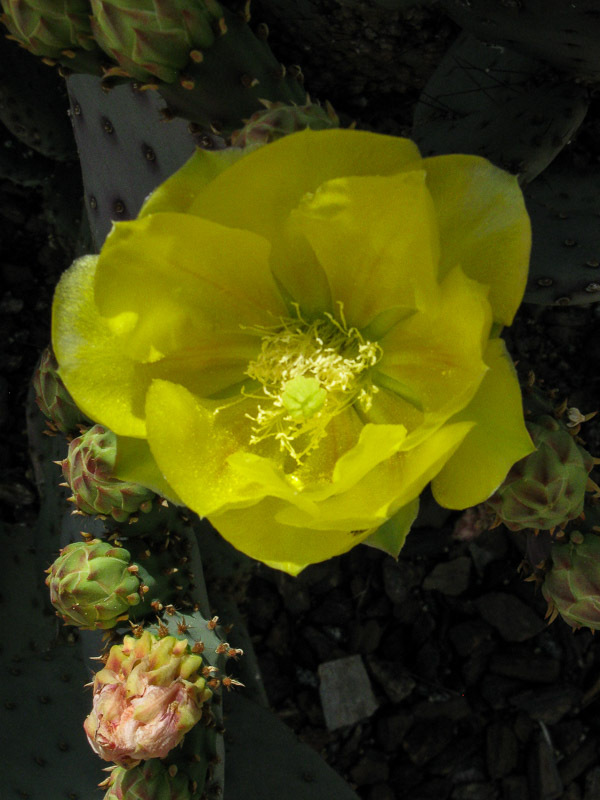 A more common Opuntia would be the yellow variety. We have several specimens in our front landscape. The pile of paddles above is more than five feet tall and if the truth be told, it would probably benefit from a pruning. This is a closeup of the flower. Note the buds in the corners of the photo. 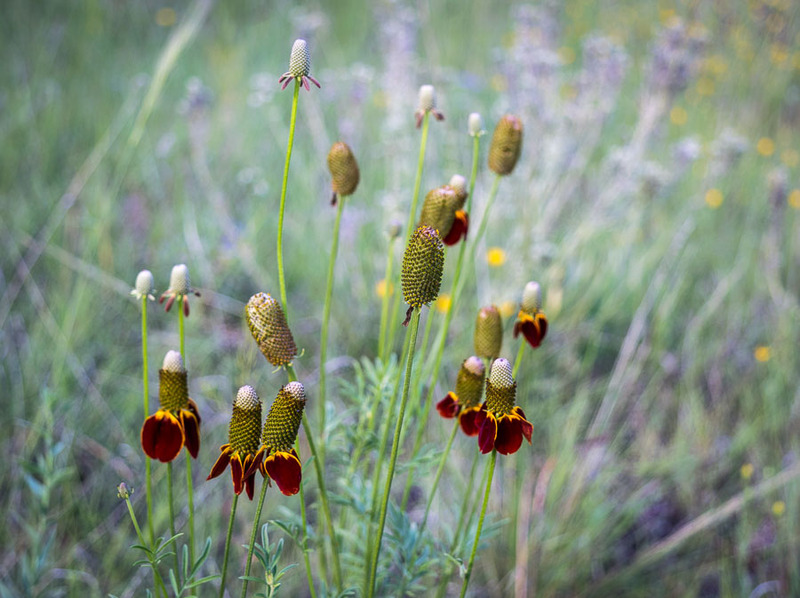 Some of the paddles have a cascade of blooms that open on the same day and form an amazing vertical line. While I am enjoying the wonderful blooms in our landscape, I hope to share more of them with JBRish readers. 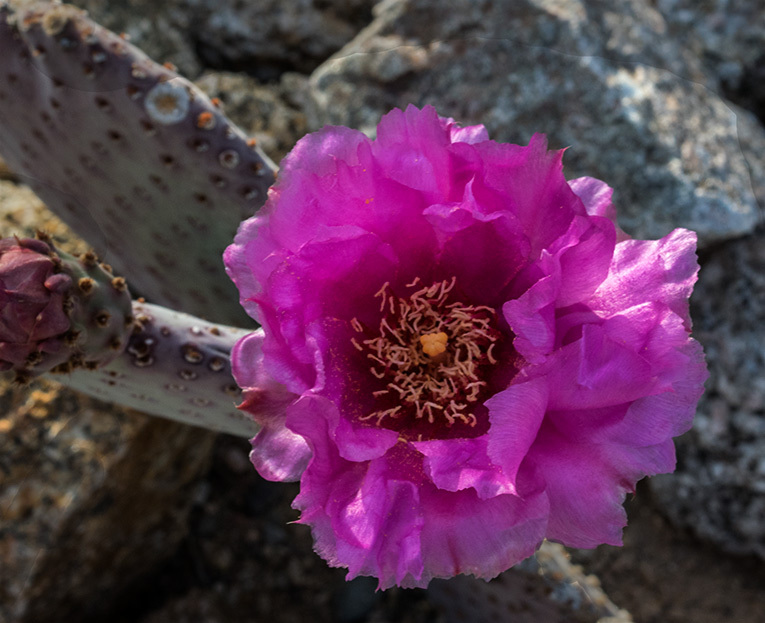 You can read more about Opuntias and Paddle Cacti at the link above. 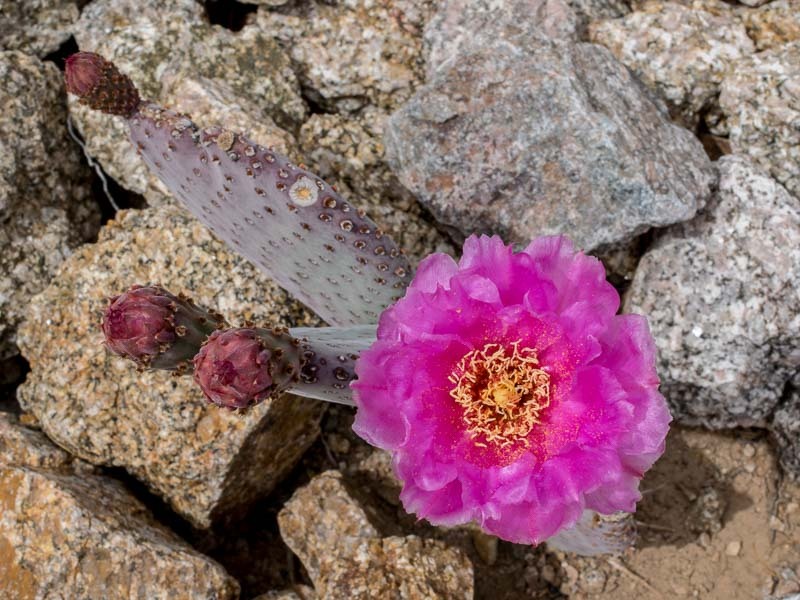 Followers of JBRish have seen a good number of flower pictures I have posted and many of them were desert natives or xeric varieties. One of the amazing qualities of Arizona is the variety of ecosystems and scenery the state has. 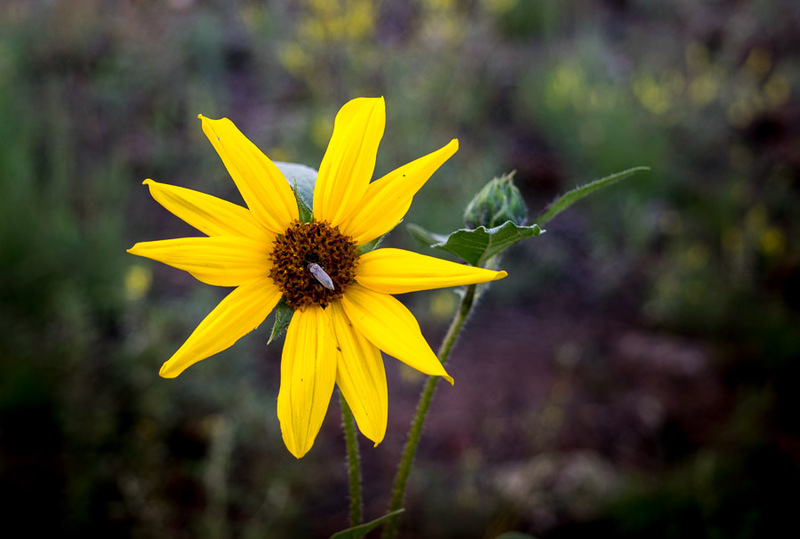 Naturally there is the beautiful and very different Sonoran Desert, but we also have the high country which includes Flagstaff and serves as a summer retreat and winter skiing destination. Last weekend we did something a bit different and very special as we celebrated the birthday of my best friend. It was a surprise getaway weekend that we planned with another very special couple-friends. 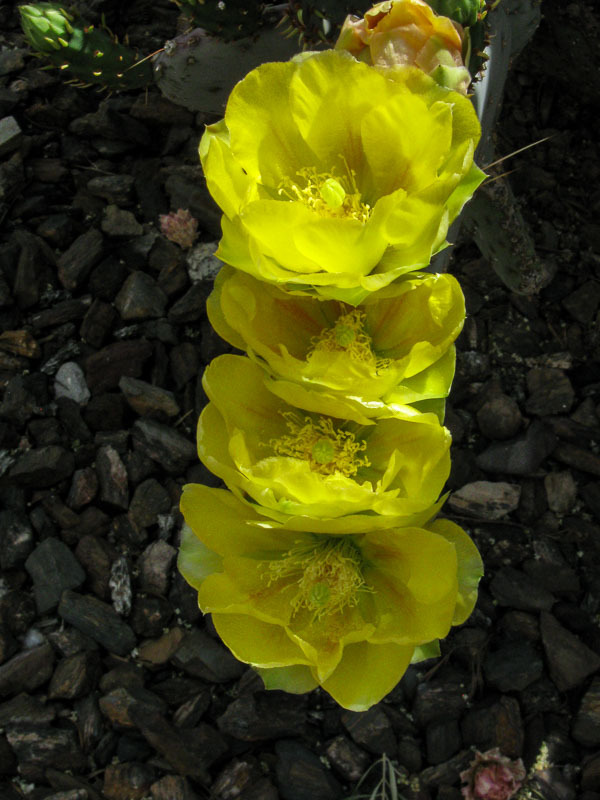 As we arrived at the door of the “birthday boy,” we saw a very interesting cactus in bloom in the front yard. Less than a few hours later we arrived at our northern destination and escaped the grasp of the 105 plus temperature for a much more moderate 75 degree atmosphere. This moderate climate enabled us to stroll the grounds of our hotel where we enjoyed the blooms of plants we don’t often see in the Phoenix area. I thought you would like to see some of them. 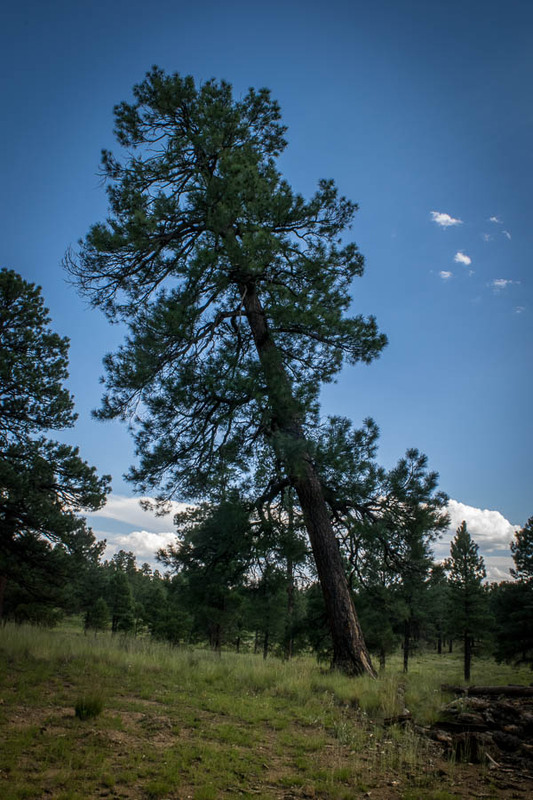 One of the first interesting sights we came across was a leaning evergreen tree. It is difficult to conjecture why this tree is growing at such an angle. Perhaps it is the result of a rainy period followed by a strong wind storm that pushed it from its vertical posture. Along the path Rudbeckia (Black-eyed Susan) had been planted which an insect found very appealing. 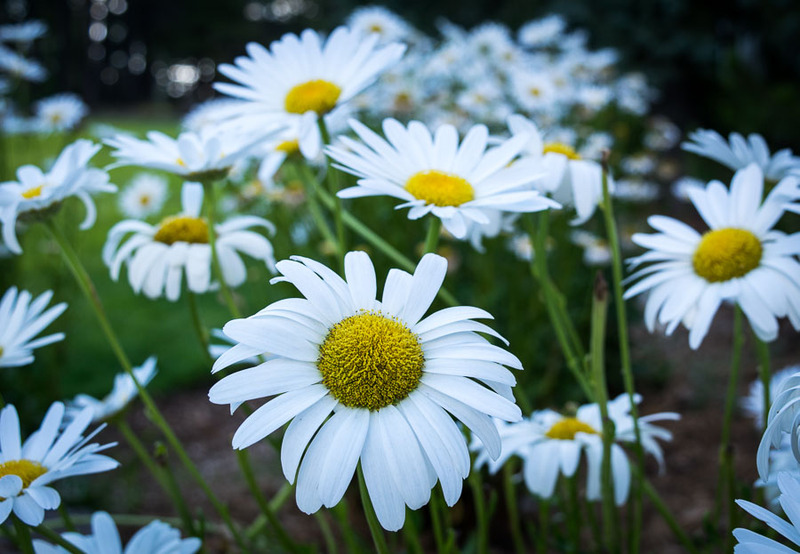 Shasta daisies were putting on a show for passersby as well. 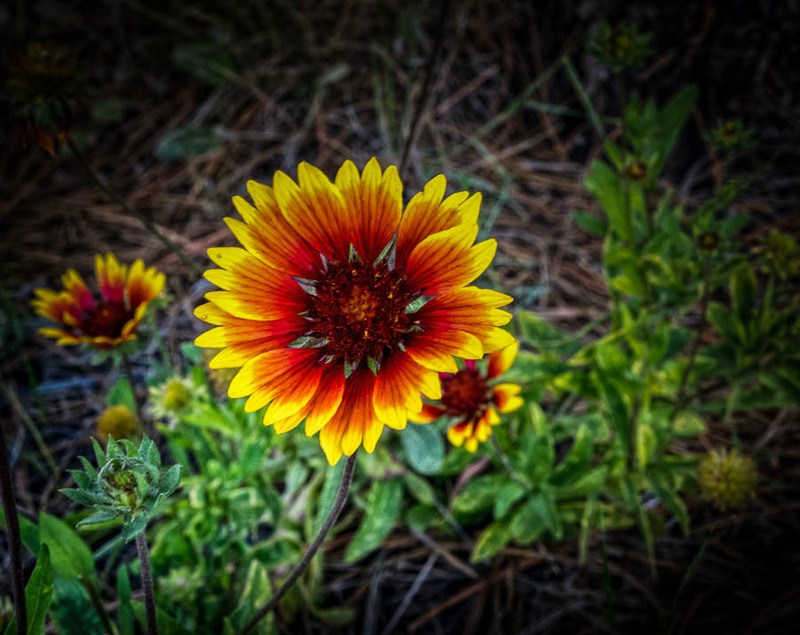 Several Blanket flowers (Gaillardia) were basking in sunnier locations. This plant also feels at home in our desert environment with proper care. 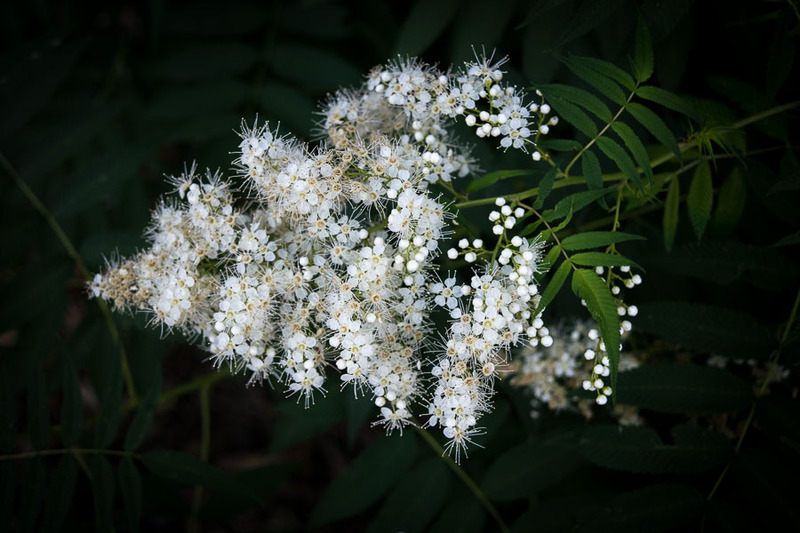 Sambucus canadensis known as Elderberry or Common Elder. 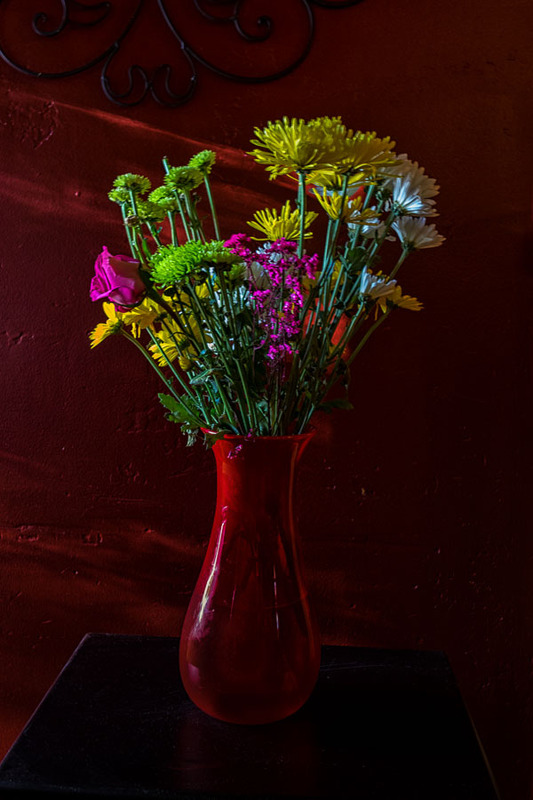 While the wildflowers and cultivated gardens were left behind, we did enjoy one more floral display later that evening.